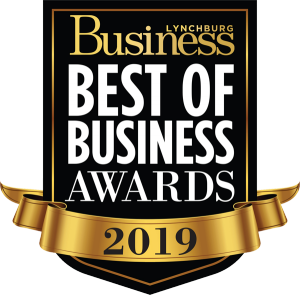 The Lynchburg Regional Business Alliance Headquarters located off of 5th street in the thriving downtown district of Lynchburg, is owned by the Alliance’s 501c3 Foundation: Central Virginia Foundation for Economic Education & Improvement. The Alliance now offers meeting room and conference facility rentals for business centric functions. View details below. 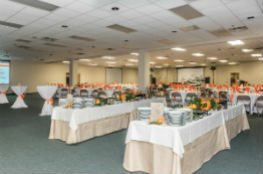 The Alliance has a large conference center perfect for hosting your next business meeting or function. This full-sized room can seat up to 350 people theater style and up to 300 banquet style. The conference center includes a staging kitchen, audio/visual and equipment, free Wi-Fi as well as chairs to accommodate your specific meeting needs. There is also access to an outdoor patio. The parking lot has 300 lined parking spaces, with 13 close up spots for handicap and VIP access. And, the Alliance is conveniently located in downtown Lynchburg for easy access of guests. All of this is inside the beautiful setting of the Alliance headquarters, a professional office building and regional center for business and industry. $150 cleaning fee added to all rentals regardless of rental fee. 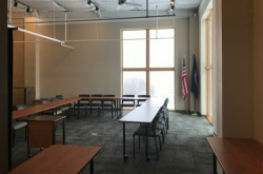 The Alliance also has an executive board room perfect for hosting your next mid-sized meeting or business event. This room is great for groups ranging from 15-50 people depending on set up configuration and is equipped with audiovisual capabilities and free Wi-Fi. A sink and countertop in the room make this perfect for small catered functions or receptions. And, the large windows overlooking downtown and an outdoor patio create a special ambiance to break away from the norm of a traditional business meeting. 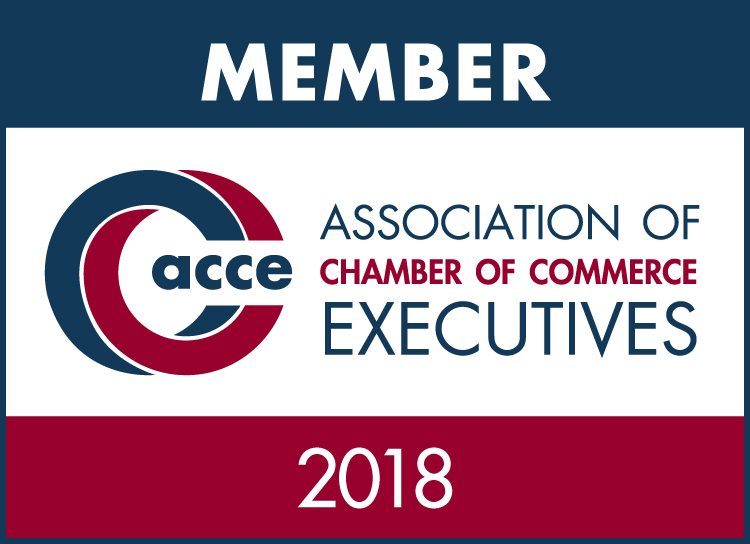 This space is available to members and investors at very reasonable rates with some complimentary uses depending on membership level with the Alliance. The parking lot has 300 lined parking spaces, with 13 close up spots for handicap and VIP access. And, the Alliance is conveniently located in downtown Lynchburg for easy access of guests. 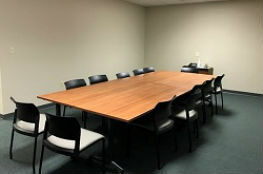 The Small Conference Room is perfect for board meetings, staff meetings, interviews and presentations to smaller groups. 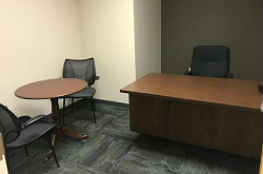 It is located right off the Large Conference Center and is an impressive room to rent at VERY reasonable rates! The room has conference tables with seating for 12 and additional chairs surrounding the table for others if needed. The room includes free access to Wi-Fi for participants if needed. This space is available to members and investors at very reasonable rates with some complimentary uses depending on membership level with the Alliance. The parking lot has 300 lined parking spaces, with 13 close up spots for handicap and VIP access. And, the Alliance is conveniently located in the downtown Lynchburg for easy access of guests. 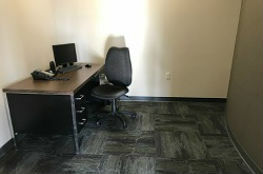 Members of the Alliance enjoy exclusive free access to three offices complete with desk and chairs. These offices are perfect for confidential meetings, interviews and offsite meetings with no interruptions! Subject to availability, members simply need to call when they want a day to work “on their business” but not in it! 9 a.m. - 5 p.m., Monday - Friday only.